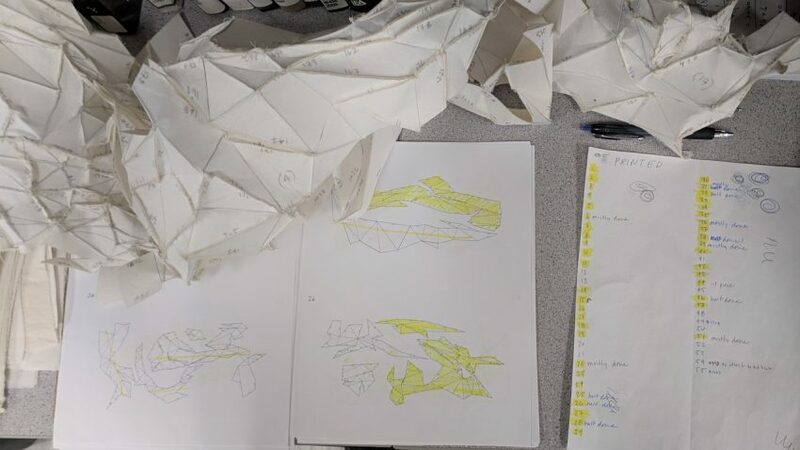 During the first semester of my fellowship in the Digital Scholarship Center, I focused on learning how to make a physical, fabric object from a digital, 3D model. In my last blog post I went over the process of figuring out a way to make this happen. You can read it here. Now, I have more than just samples! 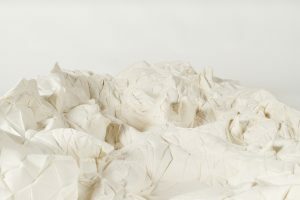 My goal was to create a three dimensional, fabric object that depicted my body embedded in a mountain range at human scale. 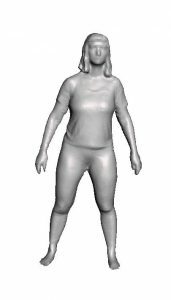 I used 3D modeling softwares Maya and Meshmixer to combine my body with the mountain range, creating an impression of me in the land; an additional topography in the mountainscape. 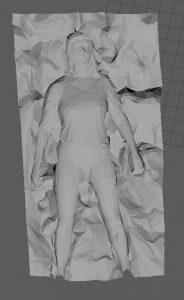 I then imported the 3D model into Pepakura, where the application turned it into a flat pattern for me that could be saved as a PDF. The PDF provides a few different pieces of information — cut lines, fold lines (mountain and valley), and edge IDs (to match edge to edge). This took a fair bit of tweaking, to find the right number of pages and position all the shapes correctly. Possibly the biggest game-changer in the whole process was that I realized I could set the PDF pages to 12” x 24”, the size of the laser cutter bed. Withy my parameters, Pepakura is able to create a PDF of all the cut lines in addition to a PDF with the fold lines and edge IDs. 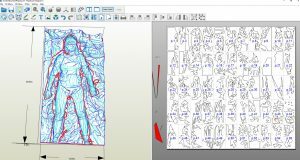 Once the PDF was completed, I prepared 55 pieces of cotton muslin with a stiff interface and ran them through the laser cutter. I then used a projector to trace the fold lines and transfer the edge IDs. After all this prep work was done, I could finally start sewing! The thing I’ve been waiting to do all semester! After this life size fabric mountain version of me was all sewn together, I built a cardboard frame to hold the sides up and then slid it on. This finished piece is approximately 6′ x 4′ x 1′. 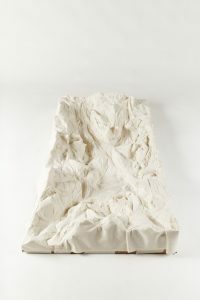 The idea behind this project came from asking myself how I find topographical intimacy (a term coined by Lucy Lippard). What does it mean to find intimacy within a landscape? How can I connect to the land? The mountains are a place with which I feel connected, grounded. 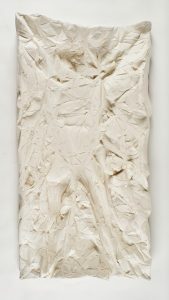 This led me to considering a sort of self portrait within the land, an intimate embedding of myself within a topography. What would it be like if I could lie down amongst these bodies of land, like lying in tall grass but at a different and impossible scale? Is the topography of my body that different from the topography of these mountain bodies? This piece would not have been conceived or constructed in this manner without my work in the Digital Scholarship Center. The way I came about this project is unique to a digital process that is not the standard way of creating 3D fabric objects, and is not necessarily the fastest way to accomplish the task. The outcome is unlike anything I would have considered prior to my time here and I’m excited about what it means for my art practice and upcoming projects.